"Mobile Procurement Evaluation Guide:Selecting a Procurement Platform"
Mobile procurement represents a solution for organizations of all sizes and across all industries to better manage their spending environment anywhere, at any time, from any device So it critical to know which evaluation criteria your organization should look for. How secure is your company data on mobile devices? Does the application work on all devices? How well does the application leverage the devices? 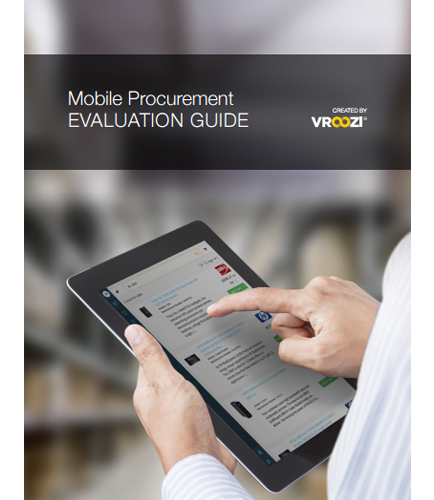 This Mobile Procurement Evaluation Guide is aimed at procurement and IT organizations in the process of developing a mobile strategy and selecting a procurement platform that can give their increasing mobile workforce continuous productivity. • Evaluating Mobile Procurement the right way to add value. • Choosing the applications that best fit your organization. • Leveraging Mobile Procurement the best way possible, to suit your company’s needs.